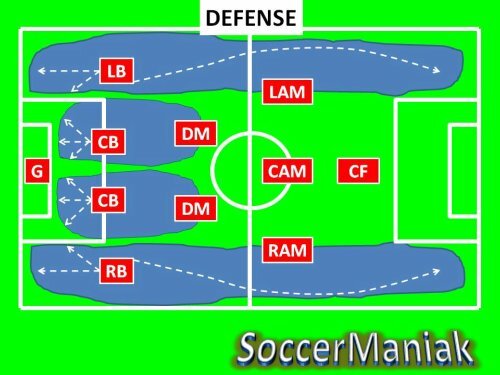 This formation is very popular and can be very successful if all players do their part on the soccer field and cover their zone in defense as shown in the picture below. 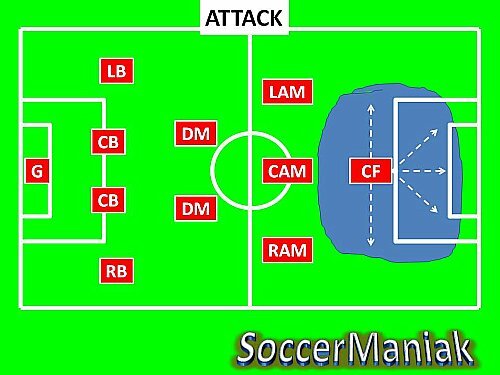 4-2-3-1 system of play can be used against most other soccer formations and the strength of this formation lies in the midfield and overlapping outside defenders (RB & LB). Weakness for this formation in soccer comes from three attacking midfield players forgetting that they have to defend and slacking off when transitioning on defense. Coaches should always set the formations to suit the players they have and not the other way around. This soccer formation will be set up with 4 defenders, 2 defensive midfield players, 3 offensive midfield players and 1 forward. As you can see in the picture above, 4-2-3-1 soccer formation is played with players marking the zone in blue. Most important part in winning games with 4-2-3-1 soccer formation is not to get scored on and to focus on defending the goal by playing zone defense with every player on the field marking their zone where communication will be the key in doing so. The only player having any freedom when defending is the Forward player. The back line of 4-2-3-1 soccer formation will be composed of 2 Center Backs and 2 Outside Backs (RB & LB). The center backs will need to be tall, strong and very good in the air having the ability to read the game well and stop players in 1v1 situations. Communication will ensure that all empty space is covered and that they are leading the defense by telling players in front of them where to position themselves and what players to mark. Communication will also ensure that players step up in sync when attempting offside traps. Back line can be quickly converted into an even more defensive formation by playing with a Sweeper role, meaning one CB playing 5 - 10 YDS/M behind the other CB. Sweeper will be the player that reads the game better than other players and he will have the advantage of doubling up on any player or reading the play and positioning himself better since he is positioned behind the defensive line. Outside Back (RB & LB) positions in this system of play will usually be occupied by players that are short, agile and very quick with good ball handling skills. Outside Backs will need to be in exceptional conditioning shape because they will run deep into offense providing support for the attack than tracking back to defend when the ball possession changes. Defense in this soccer formation will have two Defensive Midfielders in front of them taking much pressure off by providing support. 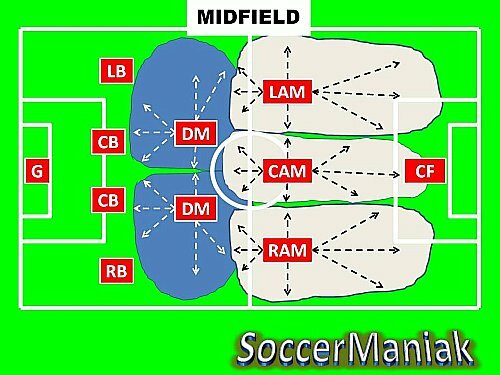 4-2-3-1 system of play midfield is composed of 2 Center Defensive Midfield players and 3 Attacking Midfield Players. The 2 Defensive Midfield players are the ones that hold the midfield disrupting the opponents attacks and also act as connecting or starting point of their team attacks. These 2 players will be the backbone of defense and they will need to be DESTROYERS on the team, not afraid to tackle hard and go for dead balls. Defensive Midfield players will want to have the ability to win headers and defend in 1v1 situations. They will also need to read the game very well. Defensive Midfield players will need solid passing skills and the ability to stay calm when the ball is passed to them because they will act as connectors between defense and attack. Their job is to protect the defense and stop the attack before it reaches the Center Backs. 4-2-3-1 formation in soccer will play with 3 Attacking Midfielders that will have to constantly join the attack helping the Forward and than quickly transition back on defense when the ball changes possession. Attacking Midfielders will position themselves into Center Attacking, Left Attacking and Right Attacking Midfield players. Right and Left Attacking Midfield players will want to spread the game down the sidelines. These players will have to be in top conditioning shape because of constantly running forward to support the attack than running back to support the defense. Because of solid defense behind the Attacking Midfielders, they will have the freedom of always joining the attack. Attacking Midfield Players will have great vision of the field spotting their teammate runs, ability to read the game very well, great ball control, exceptional passing and quick decision making skills. These players will also need to know how to score goals because they will be used as attacking force along with the lone forward. Players suited for this position will often be the ones that get most touches on the ball during practice. This player will want the ball most out of everyone else on the field and will somehow find the space to receive the ball most during practice. Having a good shot from distance and playing with both feet is a big plus. Players in this soccer position will move from their own penalty box to their opponents penalty box. The picture above shows the most important zone that each position in midfield covers. Defensive Midfield players will not want to be more than 20 YDS/M away from the Attacking Midfield line when defending. Deeper Defensive Midfield goes back when defending, Attacking Midfield will follow. This is why I say the Attacking Midfield will run from one penalty box to another. Although this formation appears as if there was only one Forward, that is not the case because of constant Attacking Midfielders joining the attack and becoming Forwards. Suddenly 1 lone attacker turns into 4 strikers. The Center Forward position in this 4-2-3-1 soccer formation is preferred to be tall and strong point man that can win the ball in the air and shield it until help arrives. This Forward will be clinical finisher with the ability to score from rare opportunities.